For many of our patients, not only is it frustrating to be dealing with the symptoms of these conditions, but it’s even more frustrating that they cannot identify the underlying cause of the condition. Instead, they end up treating the symptoms with varying degrees of success. 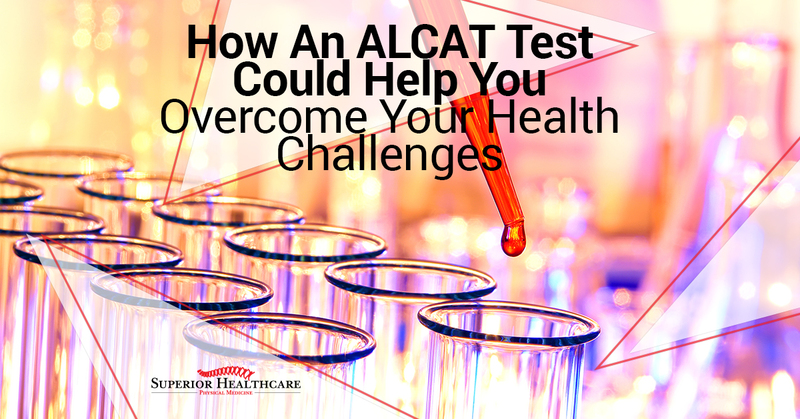 We’ve had success helping these patients by starting with an ALCAT test. This is a simple blood test. The initials stand for Antigen Leukocyte Antibody Test. The test measures your body’s response to certain substances in your diet, including foods, additives, herbs, molds, chemicals, and other things you might find in your diet. It looks at over 450 substances, making it extremely comprehensive. The test will look at how the volume of your white blood cells changes with the introduction of these dietary elements into your system. The main purpose of the ALCAT test is to identify any sensitivities your body may have to substances in your diet. The test is very safe and has been used on hundreds of thousands of patients across the United States. The process is simple; we will take a small amount of blood and send it in for testing. When your results come in, our medical team will go over them with you and help you determine the best course of action moving forward, utilizing this new knowledge about your health to overcome the challenges you may be facing with your health. When your body has a sensitivity to certain elements in your diet, it will activate your natural immune response when those foods enter your system. Your immune system’s job is to fight off potential danger to your body. It’s very good at that, but it also takes a lot of your body’s resources. Think about how you feel when you have a stomach virus. You are tired, run down, and need a lot of additional rest as your body recovers from the illness. On a smaller scale, that’s what is happening inside your body when you are ingesting the foods it identifies as harmful. These immune responses can result in inflammation, fatigue, and even gastrointestinal and metabolic disorders. Eliminating those foods and substances from your diet stops the immune response and allows your body to function more efficiently. You may find that your fatigue disappears, those mysterious aches and pains go away, your migraines stop, your skin clears up, and you might even lose those extra pounds. That’s simply your body being able to work correctly because it’s not constantly fighting sensitivities. The ALCAT can help you avoid food substances to which you may have a sensitivity. It’s not necessarily a diet but a change in your diet that could help you lose weight. That’s because one of the side effects of food sensitivities is weight gain. Other side effects include fatigue, depression, insomnia, and aching joints, none of which are great for maintaining a healthy weight, either. Food sensitivities can also increase your sugar cravings, leading to snacking and binging on unhealthy foods. The ALCAT test will tell you which foods you may have a sensitivity to, and then how to take steps to eliminate or avoid them in your diet. The results can be surprising! Imagine if, for instance, your ALCAT comes back saying you have a sensitivity to kale. Kale is known to be a very healthy food and you may be incorporating a lot of it into your diet for the iron, magnesium, and fiber. However, your body sees kale as a threat. So when you are ingesting it, you are actually working against your body to lose weight and feel healthier. You wouldn’t know that, though, without the ALCAT results. The ALCAT builds a personalized meal plan built around your body’s specific chemistry and needs, giving you the tools and information that you need to help your body work at peak efficiency. Weight loss tends to happen as a result of these dietary changes, not necessarily because of a drastic change in your lifestyle. You’ll take out those foods that are working against you and instead know how to fuel your body with the substances it can really use. The ALCAT diet is something that has been highly recommended by practitioners around the world for it’s health benefits, including weight loss. If you’ve been dieting and exercising but aren’t seeing the results you want, it may be time to consider the ALCAT as a way to learn more about what might be holding your body back. Want to Learn More About How to Fuel Your Body for Better Health? People are becoming more and more aware of the importance of how they feed their bodies. The ALCAT test is another tool at your disposal that can help you learn about your body’s specific needs and how you can take better care of yourself. The test is simple to do and provides you with a wealth of information about the foods that you should and should not be eating. If you are tired of struggling with health concerns that seem to have no cause and no answers, it might be time to look at what you are eating. Our chiropractic health center in Metairie offers ALCAT testing along with other care options that can help you overcome your health concerns and feel your best. Make an appointment with our office to learn more about our services and how we can help. You can give us a call or contact us through our website for more information or to make an appointment. We offer early morning and evening appointment times for your convenience so you can find an appointment time that works with your busy schedule.